It has been officially ... three years PLUS one month since our three year anniversary but I just haven't been in the mood to blog lately. Most of my time has been spent catching up on Smallville. I know right?! Yes the show is way over but Boyfriend and I were determined to watch the shows in its entirety, starting over from the beginning. Now that we have almost finished ... I have moved onto Parks & Recreations (shoutout to WeezerMonkey!) - it's quite a load off my mind. Our 3-year anniversary was super-hyped up and kept secret by Boyfriend, though I tried to talk him down in order to not be disappointed. He dropped hints on me FOUR MONTHS IN ADVANCE, saying stuff like he was working with one of my friends on it, wouldn't tell me which friend, promised it would be "the experience of a lifetine" ... naturally when I repeated this to people, everyone immediately thought "engagement" ... which was not so. And told me that we were going to Disneyland. And we would be having lunch at Club 33!!! Spending our 3 year anniversary at Clubb 33 seemed very appropriate. My friend Peter helped him secure reservations. I didn't even think it would be there because Boyfriend actually couldn't keep track of the name (he is obviously a Disneyland amateur) and kept calling it stuff like "Catch 22" which made me automatically cross off the restaurant in my mind. I mean, who makes reservations at a place where they don't even know the name, right? Needless to say, I was surprised and we spent the entire day at Disneyland. And yes, we wore those Happy Anniversary pins around all day. Club 33 is an exclusive club that is located right next to the exit of the Pirates of Carribean ride. Walt Disney used to entertain his guests here and it is the only place in the park where alcohol is served. Basically to get in, you either have to be a member (and pay ridiculous rates) or "know someone" to get you in. Newly built Carthay Circle at Disney California Adventure has its own counterpart, but 1901 doesn't have the same history that Club 33 does. Yums! Everytime on the menu was the same price and included the buffets in the meal. We had a 1:15pm reservation, which was perfect for the park. We got to go on a few rides in the morning and then be in air conditioning during the hottest part of the afternoon. And while you eat, Mickey and Pluto walk around, greet you and take pictures with you! It's super fun and cute. Afterwards we walked around the dining area and out onto the balcony. It was really peaceful and the weather was terrific. The restaurant was pretty packed and there was still a full seating when we left, so we couldn't get a historical tour or anything and we felt bad about going in to ask a cast member to take a picture for us on the balcony. I know I had promised to update more with the last post, but things have just been so crazy lately. My dad had a birthday, and my brother, and my co-worker ... there was Book Club ... a trip to San Francisco and Monterey ... and budgets. Budgets are the bane of my existence, the one and only time at work where I'm actually crazy busy from the moment I walk in until the moment I leave. Excel spreadsheets in size 7 font are opened and my eyesight diminishes from day to day. I think I talked about this last year too. 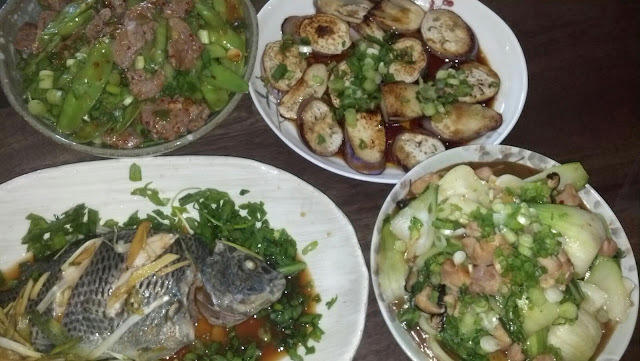 I made the above dinner one night when I was really really craving steamed fish, Asian style. I was just going to go to 99 Ranch, have them fish one out for me (haha, get it?! ), whack it until it died and then bring it home right away to steam up ... then realized that maybe Boyfriend and his Italian-ness wouldn't eat fish with the head on and he'd get grossed out. But don't Italians eat branzino?? What was I thinking. Basically out of that fear, I made the three other dishes to go with it, just in case. As it turned out, I didn't have to worry because he scarfed as much fish as he could. And poured soy sauce on his rice (from the bottle, not like, using the soy ginger onion sauce with the fish - that would have been acceptable) ... I have such a long way to go in teaching him not to do that. Put oven rack in middle position and preheat oven to 400°F. Put baking dish in roasting pan. Clean fish by removing the guts (the fishmongers at 99 Ranch will clean and scale if for you, but only if you ask them to). Using sharp kitchen shears, cut off the top fin and side fins. Rinse fish and pat dry, then rub inside and out with salt. Transfer to baking dish and sprinkle with scallion strips (white and pale green) and ginger. Stir together soy sauce and sugar until sugar is dissolved, then pour over fish. Add enough boiling-hot water to roasting pan to reach halfway up side of baking dish. This is the same concept as doing a water bath when baking cheesecake. Oil a large sheet of heavy-duty foil, then tent foil (oiled side down) over fish and tightly seal around roasting pan. Carefully transfer roasting pan to oven and bake until fish is just cooked through, about 30 to 35 minutes. While fish bakes, cut enough scallion greens diagonally into very thin slices to measure 1/2 cup. Whisk the chili-garlic sauce, soy sauce, mirin, honey, sesame oil, and cornstarch together in a small bowl and set aside. While half frozen, cut the beef lengthwise along the grain into 3 or 4 (2-inch) wide pieces. Slice each piece of beef across the grain into paper thin pieces, about 1/8-inch thick. Doing this half frozen will give you the thinnest cuts. Pat the beef dry and season well with salt and pepper. Heat 1 Tbsp of the oil in a medium nonstick skillet over high heat just until smoking. Add the beef and cook, stirring rarely, until well browned, about 4 to 5 minutes. Set aside. Return the skillet to the stove over medium-low heat. Add the remaining 1 Tbsp of oil, 2/3 of the scallions, the garlic, and the ginger, and cook until just fragrant and starting to color, about 30 seconds. Stir in the snow peas, and cook, stirring occasionally, until bright green, about 2 minutes. Whisk in the chili-garlic sauce mixture, then remove the pan from the heat, and add the beef and accumulated juices. Toss to coat and sprinkle with remaining scallions.